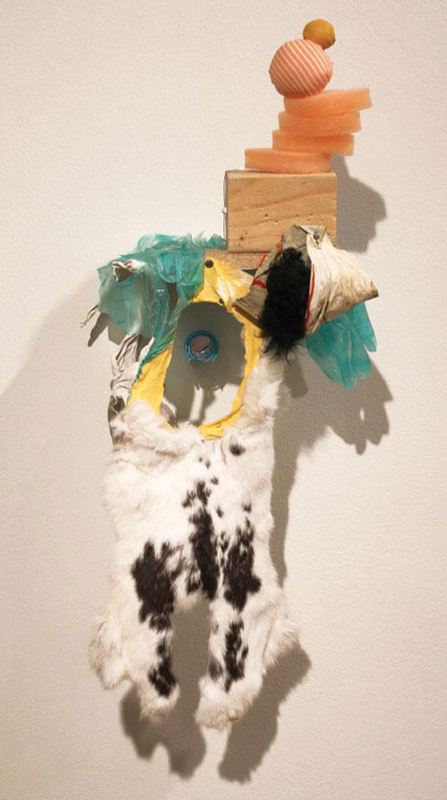 The importance of the Museum of Contemporary Art Santa Barbara (MCASB) is in full display in their new exhibition Out of the Great Wide Open, which opened to a packed house of excited art lovers last week. There is a certain amount of responsibility that comes from the fact that the MCASB is the only museum dedicated solely to contemporary art located between Los Angeles and San Francisco. As such, the current show of work from artists residing in the tri-county region between these two art meccas fulfills a need that few other venues are positioned to take on in any sustained way. It is a testament to the MCA that the artwork in this exhibition is just as diverse, innovative, and challenging as work you might find in either of these neighboring, much larger cities. The video installation “Blue Fig” by Wendy Osher brings our focus to the most ordinary of spaces. In a small, otherwise forgettable backyard, we see a solitary fig tree, changing from season to season. Documented over a period of four years, the video takes a normally unremarkable scene and brings our attention to the remarkable effects of time on spaces that would otherwise be lost in the visual cacophony of contemporary life. A similar theme is explicitly addressed in the work of Ryan Bulis, who evokes Josef Albers’s “Deep Seeing” as a remedy for the sensory fatigue that causes us to ignore so much of what is around us. Bulis combats this by incorporating interactive play into his work. Both “Casual Upright” and “Bridge A to B” actively encourage the viewer play with the various wooden objects contained within, inviting a new kind of experience with these ordinary materials. 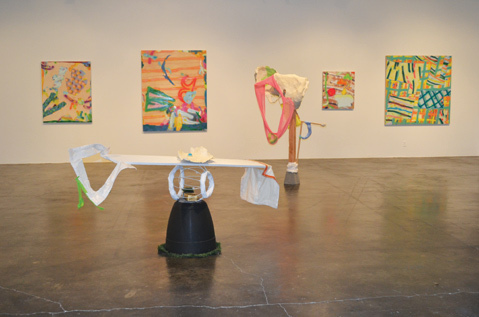 Sculptures by Sommer Roman, which are scattered throughout the exhibition space, are similarly playful and also emphasize an alternative experience with the familiar. Roman makes use of found objects and a variety of textiles to create surreal, biomorphic sculptures captured in unnatural formations, as if laboriously frozen in a single moment of time. Each of the four painters featured in the exhibition work with a certain degree of abstraction, but that is where the similarities stop. Seyburn Zorthian’s paintings emphasize the action of their creation, and titles like “Orchid Beat” and “Half Time Feel” suggest a musical dance that that is documented in each piece. The large wall painting “No Sinking New Ships” by Cathy Ellis is a humorous juxtaposition of idyllic scenery and surreal postapocalyptic disaster; while the brightly colored abstractions by Nick Wilkinson create a wonderful confusion of depth that are at times reminiscent of the 3D Magic Eye posters from the 1990s. Perhaps the strongest showing of work in this exhibition comes from Erik ReeL. His flavor of abstract painting harks back to Paul Klee, Cy Twombly, and Mark Tobey; but his mark-making technique also brings to mind California’s post-surrealist Dynaton movement of the late ’40s and early ’50s. However, it is the surface of the six acrylic paintings on paper that demands attention. At first glance the paintings seem ultra-flat, as though produced by some sort of printed technique. However, upon extremely close inspection, innumerable layers become evident, where brushstrokes have produced microscopic valleys and canyons into which the powdery pigment bleeds from ReeL’s personal hieroglyphs. Step away from the piece, and a similarly profound macro level of depth becomes evident, as these marks float at various altitudes above a background that seems infinitely far away. These six pieces and the two large canvases that accompany them are reason enough to go to see what is in total an intriguing and thoroughly enjoyable exhibition.